According to examinees, some of the items that were included in the recently concluded Civil Service Exams are problems involving Venn Diagrams. So, in this series, we will discuss in detail how to solve these types of problems. If you are not familiar with Venn diagrams, please read the Introduction to Venn Diagrams. Problems involving Venn Diagrams usually discusses choices of groups of people. Let’s have the first example. (a) How many students are not taking English, and at the same time not taking Math? (b) How many students are in English class only? in Math class only? 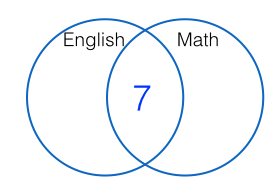 The most effective strategy in solving problems such as this is to create overlapping circles which is usually known as a Venn Diagram. 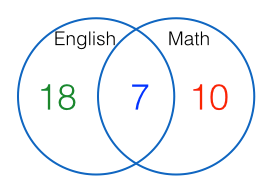 Venn diagrams are used to represent sets. In this problem, we are actually talking about sets, their union, and their intersection. Below is the Venn diagram of the problem above. 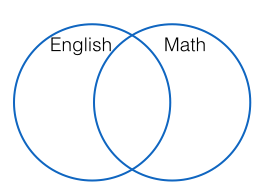 First, notice that the overlapped part belongs to both Math and English, so we can place the 7 students who are taking both subjects in that overlap. Second, the problem says, there are 25 students taking English. But from the diagram, 7 are taking both subjects. So, the only number of students who are taking English and not taking Math is 25 – 7 = 18. Third, there are 17 students who take Math, but 7 of those students are also taking English. Therefore, there are only 10 students who take Math and not English. 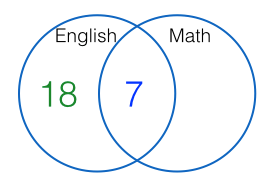 So, all in all, there are 18 + 7 + 10 = 35 students who are either in English, Math or both. Since there are 40 students in all, 40 – 35 = 5 of them are not taking English and at the same time not taking Math. This answers the first question. If we want to represent the universal set which is all the 40 students, we can place the overlapping circles inside a rectangle (or any other shape) and place 5 inside that rectangle but outside the circles as shown below. 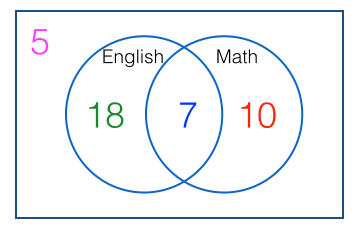 From above, it is also clear that 18 are only taking English and not Math, and 10 are taking Math and not English. This answers the second question.